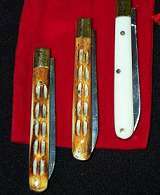 These knives are made of real bone and each handle is custom jigged and fired. The Bone Handles look great and are wonderful to use. Perfect in everyway. If you are looking for a really great collectable quality knife set, this is it. This is a limited edition.